We have just installed a Naughty Corner as our toddler is now firmly in his terrible two's and we think that he is ready for some firm disciplining! Here you can see it brand new and as yet unused without the tenant. I must take my hat off and thank Super Nanny for the valuable toddler lessons we have learned. On the same day I installed it (today) I used it TWO TIMES with Ethan and it worked Super Well just like on Super Nanny! When watching that reality TV show we often think, "Does it really work that well?" And now my answer is yes, it does...if you follow her rules! only of interest to parents of young children! Preparation >> A few lessons we picked up: The naughty corner must be in a well-defined spot, so a sign helps the toddler know what it is. Daddy came up with this particular one and stuck it on the wall together with Mum's cushion idea so Ethan knows where he is supposed to stay. Also, it must be in a place in the home that is away from the fun and action but in line of sight so the parents can see when the toddler moves out of the naughty corner. There must also be an explanation to the toddler before it is used, what it is and how it works. All explanations and communications are to be done at their eye-level with a firm voice! Ha... looks easy on SuperNanny, but that's a lot of things to keep in your mind when you actually practise it. 4.45 PM >> Ethan wakes up, moves out of his room and eyeballs the new home addition with curiosity. Daddy sits on the floor next to the naughty corner with Ethan and explains it to him and surprisingly he understand perfectly well. When I say "naughty corner", Ethan squirms and looks away. He knows it's not a good thing. The preparation is done. 6.30 PM >> It's dinner time which has become increasingly difficult over the last few weeks. Ethan does not want to sit down and insists on playing with his current toy which is a common occurrence. After a few warnings it was naughty corner time. "You're going to the naughty corner because you didn't listen to Daddy and didn't sit down for dinner when I told you to." The requisite bawls and cries came from the corner. He stayed there longer than I thought he would... but after 1 minute he stood up and walked. Ever a student of Nanny JoJo, Daddy quickly picked him up and popped him back on the corner without saying anything. Ethan cried again and stayed there for another minute but just as I was about to end his naughty corner time he stood up again, so I repeated the silent reinforcement of the naughty corner and after 30 seconds went back to him. Throughout this his cries changed from defiant to a soft sob with more calmness. The time in the corner is definitely good for him to calm himself emotionally and stop the escalation! "Ethan, you're in the naughty corner because you didn't listen to Daddy when I told you to sit down for dinner. Are you ready to come for dinner now?" Sob sob... "Say sorry to Daddy and you can come for dinner." He sobbed some more, seemingly unable to vocalize, but he hugged me so I picked him up. He was still a bit reluctant to sit in his high chair but this time he did and ate his dinner without crying or fuss! It was a big success but the better one was to come after dinner! 7.15 PM >> DInner was over and it was time for bath time. This has been an escalating difficulty with screams and yells over the last few weeks. Renata and I had discussed it and tonight was naughty corner time if it was to happen again. We were nervous that it being firm on discipline would make him more upset but we committed to it and tried. The results were amazing! "Ethan you're in the naughty corner because... " He interrupted me by looking upward, pointing at the sign and clearly voiced, "Naughty corner!" "Yes, Ethan, this is the naughty corner and you're here because you didn't listen to Daddy when I said it was bath time. Say sorry to Daddy and you can come for a bath now." No response. No cries, but no response. "Do you want to come for a bath or stay in the naughty corner?" Very clearly he said to me, "Naughty corner!" and sat down again! Again I stopped myself from laughing and moved off. After some silent laughter in the kitchen I pretended to read the papers and ignore him and he stayed there for 2.5 minutes without moving this time! By the end of 2.5 minutes he was agitated. I went to him and explained again. 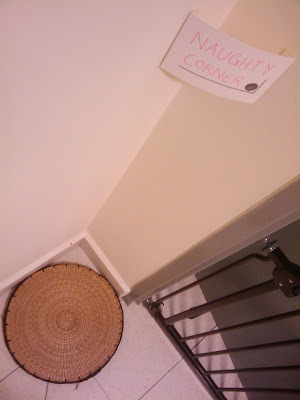 "You are in the naughty corner because..." Ethan pointed upward toward the sign, "Naughty corner!" he said. "Yes, Ethan, you're in the naughty corner because you didn't listen to Daddy when he told you that it was bath time. Are you ready to say sorry and take your bath now?" Ethan hugged me and said, "Bath Daddy" and quietly walked into the bathroom with me! Conclusion >> He was calm and though obedient, his spirit wasn't broken! This was wonderful! Bath time and the ensuing bed-time was a very calm and pleasant affair. So thank you, Super Nanny! It went so well and things were so calm that night that we went out for dinner and Mummy treated Daddy to a pork-knuckles and swiss rosti at Marche afterwards!